So, one year later another thing was crossed off my bucket list. We went to Mt. 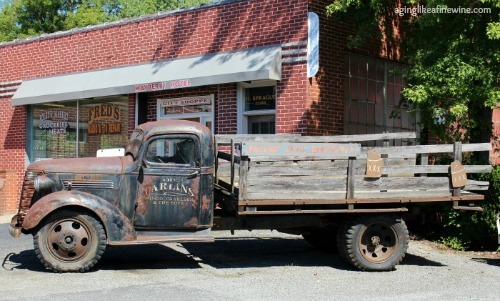 Airy, North Carolina and joined in the Mayberry Days Celebration that’s held each year in September! Mt. 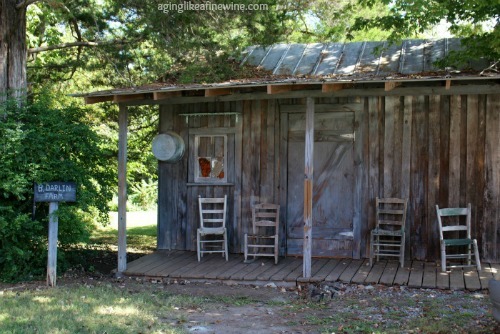 Airy is a small town with a population of a little over 10,000. Before going to Mayberry Days I was under the false impression that this was where the show was filmed. It was disappointing to me to discover that I was wrong. But it is, however, the town Mr. Griffith grew up in and based Mayberry and its characters on. 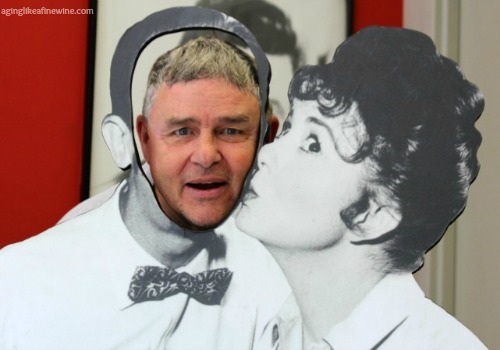 We arrived at “Mayberry” on Friday and the celebration was in full swing. We spent the afternoon roaming around town checking out the shops and town folk. The little barbershop where Andy grew up getting his haircut was obviously the motivation behind Floyd and his barbershop. 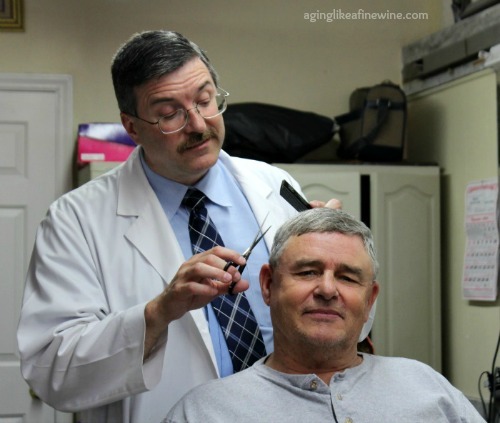 During our visit Paul hopped into the 1920’s era chair and received a trim from a Floyd tribute artist. This guy had Floyd’s mannerisms and voice down perfectly! I ran into Otis and just had to get a picture with the lovable town drunk. 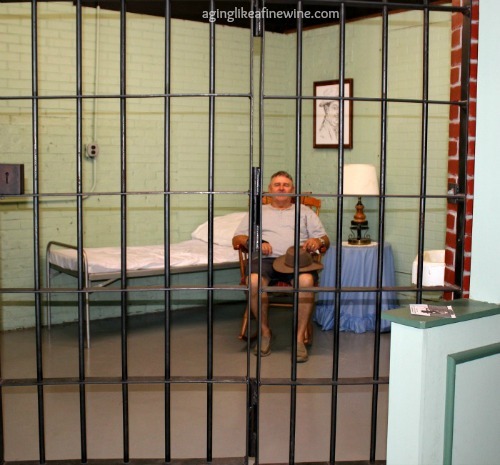 Otis said he’d just been released from his usual night in the jail, so we decided to check out the local “accomodations”. I have to “try” to keep Paul out of trouble everywhere we go! 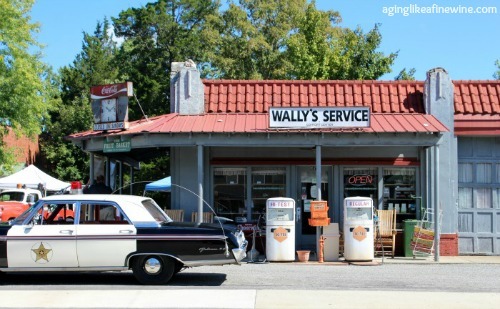 After all that was dealt with; it was on down to Wally’s. And from there, on over to see the Darlins. 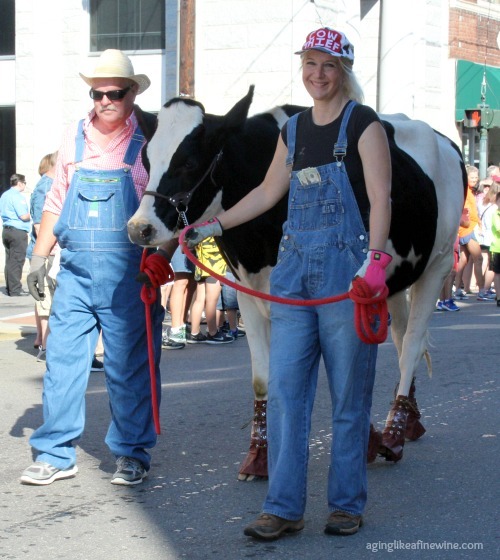 Our favorite part of Mayberry Days was the Saturday morning parade. 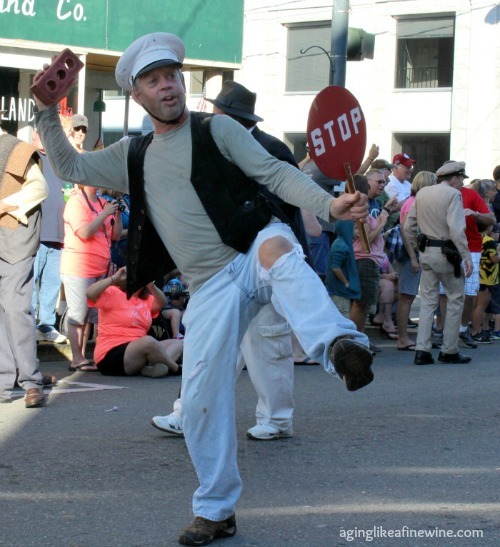 Many characters from the series were on the prowl for the parade including Ernest T yielding one of the bricks he loved to throw. Remember the episode where the stealthy thief pulled the wool over everyone’s eyes by putting shoes on a cow! 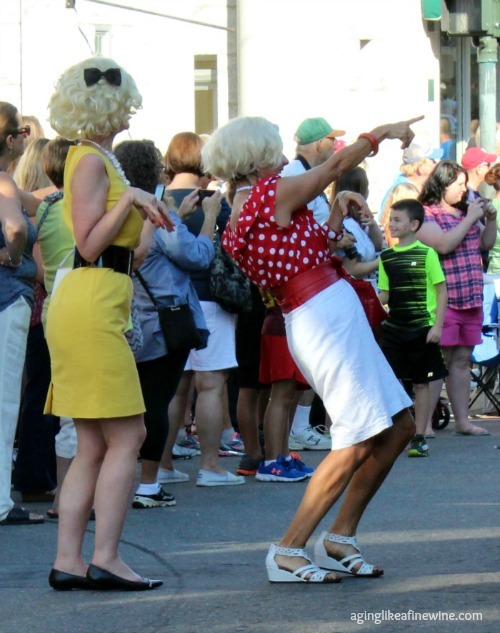 The characters I had a blast watching in the parade were these two ladies from the episode called “The Fun Girls”. Remember that one? These two were having a great time being flirtatious up and down the parade route! Of course Barney had to get involved! Or Bernie, as they called him! “The Darlins” showed up to entertain us too. I’ve always loved their mountain music! 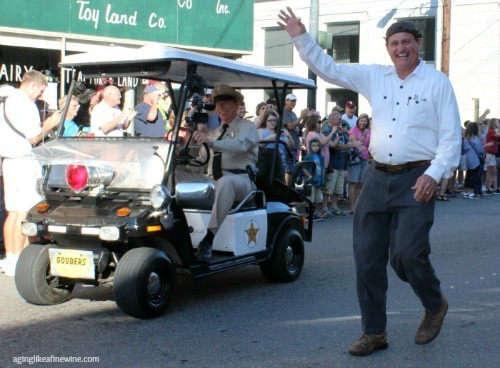 You can’t have a Mayberry parade without Goober, and of course Barney just being Barney and stirring things up. And last, but not least, little Opie. In addition to the fabulous tribute artists and the parade, there were many shows you could take in with great music and comedy. And a BBQ cook-off took place on Friday evening that was sufficient to make anyone’s mouth water! 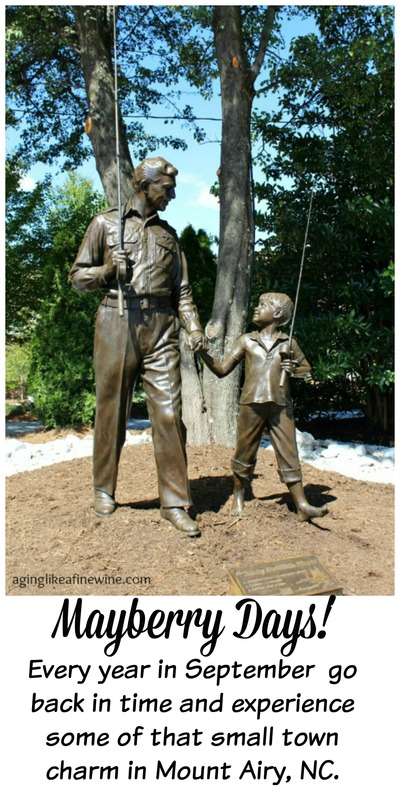 There is also an Andy Griffith museum with lots of photos and memorabilia from the long running series. 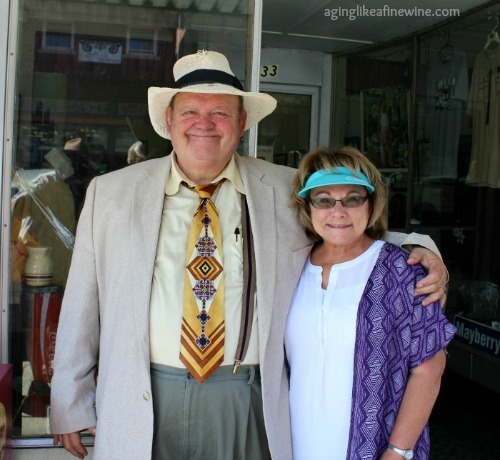 It was a fun weekend for this couple that grew up enjoying the crazy cast of characters from the warm and friendly Andy Griffith Show. 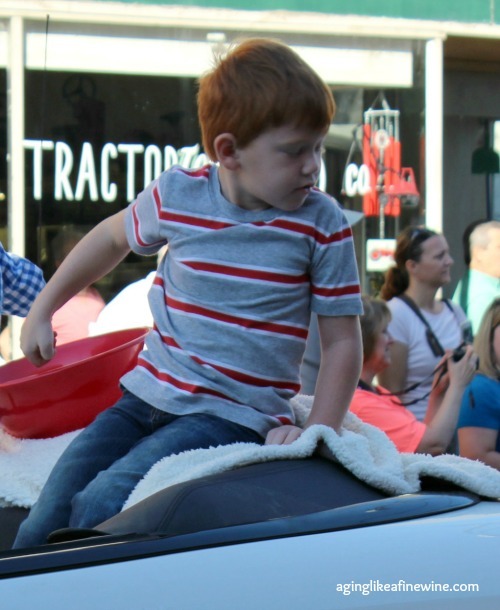 If you’re in the same special age bracket that we’re in, you just might enjoy visiting Mayberry Days too! P.S. If North Carolina is in your plans for next September, don’t forget Mt. 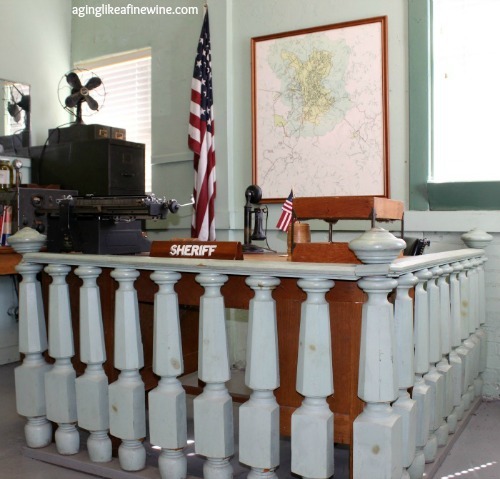 Airy and the Mayberry Days Celebration! sounds like a great time. You always find fun things to do! Thank you Nina, it’s always fun to get away for a few days! Miss you! Loved your post! 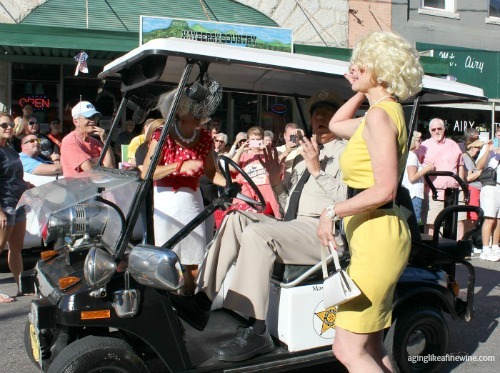 I have been to Mayberry Days! My daughter lives in King NC and works in Mt Airy at the assisted living home that “Thelma Lou” lives at. Great pictures and story. One day my daughter said to me…”Mom, after your generation, no one will even know about Mayberry” Isn’t that sad to think about. Thanks Pam! It is so sad to me too. I had said to my husband on our trip that there would begin to be fewer and fewer people at the celebration because our generation would be the last to remember that wonderful TV show. I still turn the Andy Griffith show on almost every morning as I’m puttering around the house or blogging! Thank you for stopping by! Oh my gosh what fun! My husband loved that program and a few years back a friend gave him the entire series on DVD. We had such a good time watching it all again. If we ever get to North Carolina we will have to plan the trip for September! thanks! I have the show on almost every morning as I’m puttering about the house. The wholesomeness of it, especially now, is a welcome reprieve from the news! I love finding unique places to visit and share. Thanks for stopping by!